Unconventional Housing: What Do Tiny Houses and Rammed-Earth Homes Really Cost? Becoming a homeowner sure isn’t cheap. Even if you can save $1,000 by taking out a mortgage from a specific bank, or share expenses by renting out extra rooms, it’s still not cheap to own your own home. Last year, the median price of an existing home in the U.S. was $188,900. Of course, that’s the median price and it includes the $1 million average home price in San Francisco as well as a county in South Carolina where average home prices hover around $37,000. So, it’s not representative of prices in most locales. With many people tiring of living in conventional and “cookie-cutter” developments, some are opting for unconventional types of homes, such as tiny houses and rammed-earth designs. But how much do those unusual homes really cost? The Tumbleweed Tiny House Company charges $410 per square foot for its “Elm” model, which costs $66,000 at 161 square feet. The more deluxe models can run up to $124,900 for a 400-square-foot home. Another tiny home company, Rocky Mountain Tiny Houses, prices a 136-square-foot model at $27,350, according to Forbes. This might seem like a steal, but it breaks down to $201.10 per square foot; cheaper than many options, but not what many would call dirt cheap. Of course, if you’re paying someone else to swing a hammer and handle the logistical headaches of construction, it makes sense that it doesn’t come cheap. Many budget-conscious tiny home builders keep their costs down by doing the work themselves. And it seems like half the fun of living in a tiny house is custom-designing it to include a tiny nook for your tea cups and a secret hideaway hole for your favorite treasure. Two tiny home builders, Andrew and Gabriella Morrison from Tiny House Build, tallied up their costs and found their total expenses to be $22,744.06 for the home, which comes to $65 a square foot or so, including loft space. This number excludes cabinetry and appliances for a bare-bones estimate. The actual cost came to $33,089.72, including $1,400 spent on a composting toilet, as well as cabinetry and appliances. However, this total doesn’t include a penny in labor costs since the Morrisons did the work themselves. (Plus, Andrew had been a professional builder for 20 years, so he knew what he was doing.) It also doesn’t include a place to park their tiny home, so unless you have a piece of land already or a code-compliant plot to borrow, be sure to keep that cost in mind. The average cost of a tiny home is $25,000-$30,000, according to Tiny House Talk, which includes a new trailer to hold your home, new materials, professional construction plans and appliances. 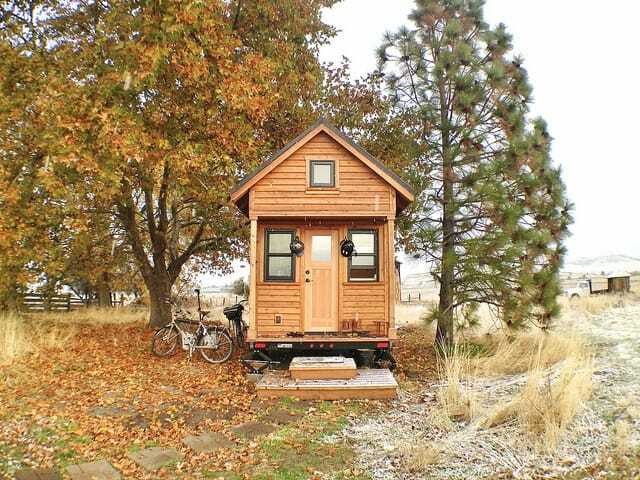 However, one tiny house builder named Sage built his for only $4,000, performing all the labor himself. He calls it a “gypsy wagon style” home. Obviously, building your home yourself will save you some money. However, be sure to learn about the best techniques ahead of time. If you have to pay a professional to fix your blunders, it will likely cost more than if you paid someone to build it the first time. And some things, like electricity, require the special attention of a trained professional. If you work on your tiny home yourself, the most expensive part of your build will be the materials. Keep an eye out for quality used materials on sites like Craigslist and Freecycle, and at second-hand retailers such as Habitat for Humanity Re-Store shops. Be ready to modify your design to accommodate cut-rate high-quality used doors and windows if you can find them. Another popular style of unconventional home is the rammed-earth model, which is popular in the deserts of the American southwest. These eco-friendly homes feature rammed-earth load-bearing walls (usually created by pounding earth into used tires with sledgehammers), passive thermal energy systems for heating and cooling, water recycling systems (typically including rainwater catchment), and composting systems. They are positioned relative to the sun to enhance the passive solar heating design. Reused bottles and cans can create beautifully designed interior walls. One New Mexico company sells plans, teaches workshops and even builds these homes under the brand “Earthship.” A custom-designed Earthship can be a pricey endeavor: design can cost more than $10,000, followed by construction drawings which can run $15,000-50,000. On top of those costs, construction expenses start at $250 per square foot. If you’re open to a standard model rather than a custom design, the “Global Model Earthship” runs around $225 per square foot for construction, but don’t forget the cost of construction drawings (up to $10,000). Of course, you also need to purchase the land where you’ll construct your Earthship. The Earthship website says that the homes “cost about the same as a conventional home,” but they also boast ecologically friendly money-saving features, including ways to make electricity (often using solar) and recycle water through their multi-step treatment system. Earthship Village Colorado is an in-progress development of these eco-homes near Colorado Springs, Colorado, where homes cost between $200,000 and $600,000, according to The Gazette. And that’s before you purchase a lot in the development, which start at $50,000. Rammed-earth homes are much less expensive if you construct your own. Obtaining used bottles, cans and tires and performing as much of your own labor as possible will reduce costs significantly. However, you’ll still need a plot of land to build it on, necessary building permits, materials, appliances, parts and expertise for rainwater and electric systems, and more. While these homes aren’t budget models, they are good choices for people seeking a certain type of lifestyle, often in a community with other like-minded individuals. Your Turn: Would you consider living in one of these unconventional homes? If you have, we’d love to hear your stories!